EggMcMisery.ca - Cracking Open Canada's Rotten Egg Industry. 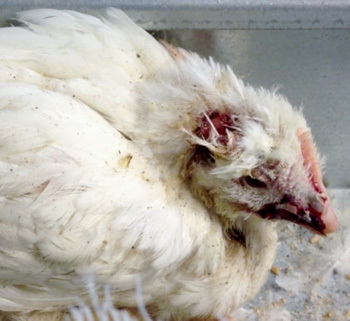 Is the secret ingredient in McDonald's Egg McMuffins blatant animal cruelty? After reviewing the undercover footage, Dr. Ian Duncan, Canada's leading expert on poultry welfare, stated: "The battery cages are overcrowded and the birds show extreme fear whenever a worker passes. The high number of trapped, sick and injured birds in the cages is unacceptable." Chickens are intelligent and sensitive animals, yet these hens are crammed in tiny cages for their entire lives, never able to walk, perch, stretch their wings or do nearly anything that comes naturally to them. 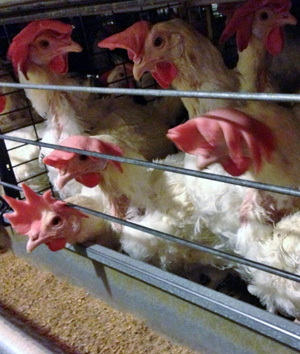 McDonald's in the European Union did away with these abusive cages back in 1998—15 years ago! It’s time for McDonald's Canada to do the same. Please urge McDonald's Canada to do the right thing. Take action here. Then take further action to prevent cruelty to chickens and other farmed animals by rejecting meat, dairy and eggs and choosing a compassionate vegan diet.